» Where did the bike lane go? Where did the bike lane go? 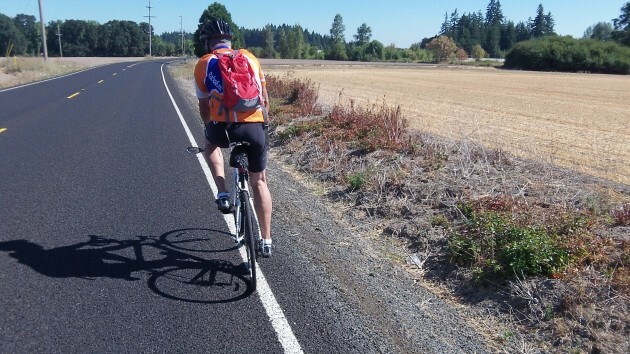 The bike lane has all but disappeared along this part of Independence Highway in Benton County. Here’s a question for the Benton County road department: Why did you do away with the bike lanes on Independence Highway when you restriped the road this summer? The northern end of Independence, from Camp Adair Road to the Polk County line, was one of the roads that got a chip-seal treatment from the county this year. I wrote about this two weeks ago, noting the rougher surface and the increased road noise. And Public Works Director Josh Wheeler explained that the 3/8-inch rock now used in chip-sealing makes roads last longer. Fine. But why make things not just rougher but also more risky for bike riders and drivers by all but eliminating what used to be a fairly decent paved shoulder on the side of the road? On Independence, the shoulder available to cyclists — and occasional pedestrians — used to be at least a couple of feet wide. Now, the newly painted white fog line on the fresh layer of chips is about a foot to the right of the old one, on average. And in places there’s hardly any space at all between the fog line and where the loose gravel starts. Cyclists have to ride in the traffic lane whether they want to or not. Surely that’s not in the spirit of the Oregon Bike Bill. Chip-sealing may not be the kind of road project that requires a reasonable amount to be spent on bike facilities, but it should hardly be an occasion for changes that expose both cyclists and motorists to unnecessary risks. This would not have happened under Roger Irvin’s watch!